Disney's portrayal of its commercial development as an idyllic springs setting strikes springs defenders as another "Flori-duh" moment. Real springs are plagued with pollution and shriveled flows caused by development. I love the comment on the OS site about their disappointment that Splash Mountain and Big Thunder Mountain aren't real mountains. There is an epidemic in this country, and it's called People With Far Too Much Free Time. I am shocked, shocked to learn there is a fake thing at Walt Disney World. I hope that the OS commenters were equally disappointed that Space Mountain is neither a real mountain nor in space. Don't they say Space Mountain is the largest mountain in Florida? There was a Jeopardy question (answer) the other night that went something like: "The state with the least change in elevation: from 0 to 345 feet". And I said "What is Florida, Alex?". I was right for 400 bucks. One of the commentators waxed satirical, "reporting" that the Sierra Club was protesting WDW, as the leader arrived, ready to climb Big Thunder Mountain, Splash Mountain and Mt Everest, only to learn they were all fake. No one tell him those meandering streams all over WDW are actually part of the resort's water management system. Worse, it's now a Stitch-themed attraction. 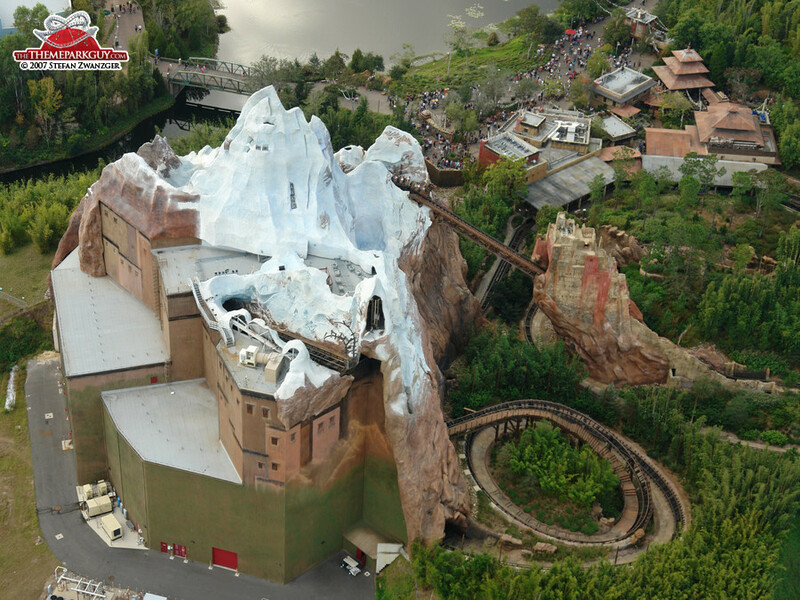 In fact, if you were to look at the back of Expedition Everest (a fake Disney mountain, duh) from a bird's eye view, you can see the warehouse-like building they disguise as a mountain. How dare you post that picture. Everything I know is a lie!! The magic is gone from Disney for me now. I had a walk-down on Everest with the lights on. That sure gives you a different perspective of the ride. Like a big 'ole pole barn. Very much so. I got to go through the year it opened with a couple technicians from Vekoma that I worked with before during one of my trips down. Just happened to literally run into them on the midway and they invited us in. Still love Space Mountain when the lights are on better though.